(MP078). Vice Admiral Sir Roderick Macdonald (1924-2003). Oil painting on canvas signed not dated..
Standard size: 12.5 x 10 ins (31.8 x 20.5 cms) approx. An eye-catching painting in true Roddy Macdonald style of an SSN thought to be HMS COURAGEOUS in the 1970’s on the surface off Holy Island. 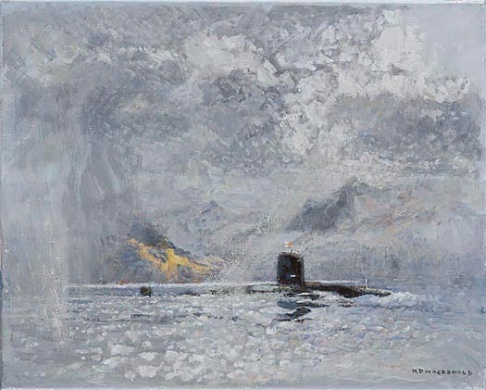 Whereas many artists find the mean, sparse lines of a black submarine porpoising along on the surface hardly worthy of their painting talents, Admiral Roddy - no stranger, of course, to painting warships has clearly enjoyed adding some drama to this picture: a heavy shower (of rain or sleet?) falling on Holy Island, a glint of strong sunshine breaking through to illuminate the lively sea; and at the heart of the scene this menacing black creature, white ensign flying proudly from the fin.